Arcora Foundation’s SmileMobile, a mobile dental clinic, will join with many other organizations and thousands of volunteers to provide free health care to an expected turnout of more than 4,000 people at the 2018 Seattle/King County Clinic Sept. 20-23 in Key Arena at Seattle Center. (See previous article). The Seattle/King County Clinic is an annual event organized by the Seattle Center Foundation. While many of those seeking medical, dental and vision care are likely to be from King County, the clinic has historically drawn people from all over the state, and dental care is usually the most requested service. Dental treatments available at the Clinic will include cleanings, extractions, fillings, crowns and root canals. Oakes said people with Apple Health (Medicaid) have dental benefits but still have difficulty accessing care, noting that fewer than one out of four of the 1.1 million adults in the state who have Apple Health (Medicaid) saw a dentist in the last year. “This event is critical to helping working families in our region access much-needed health care,” said Teresa Mosqueda, Chair of the health committee on the Seattle City Council. “Oral health is essential to overall health – unmet oral health needs can cause detrimental impacts on physical health, pregnancy, educational attainment and employment opportunities. The Seattle/King County Clinic runs from Thursday through Sunday. The last two days tend to be the busiest. Free admission tickets are given first come, first served starting at 5am each morning. Patients are encouraged to wear comfortable clothing, and bring food, water and any medications they need to take during the day. To help people obtain dental care, Arcora Foundation developed DentistLink, a free online service that patients can use to connect with a dental practice that will accept their insurance, including Apple Health. Patients can also call or text 844-888-5465. DentistLink is available to everyone including insured and uninsured. Arcora Foundation (formerly Washington Dental Service Foundation) is a nonprofit dedicated to improving oral health and health equity by partnering with communities to prevent oral disease, transform health systems, and increase access to care. 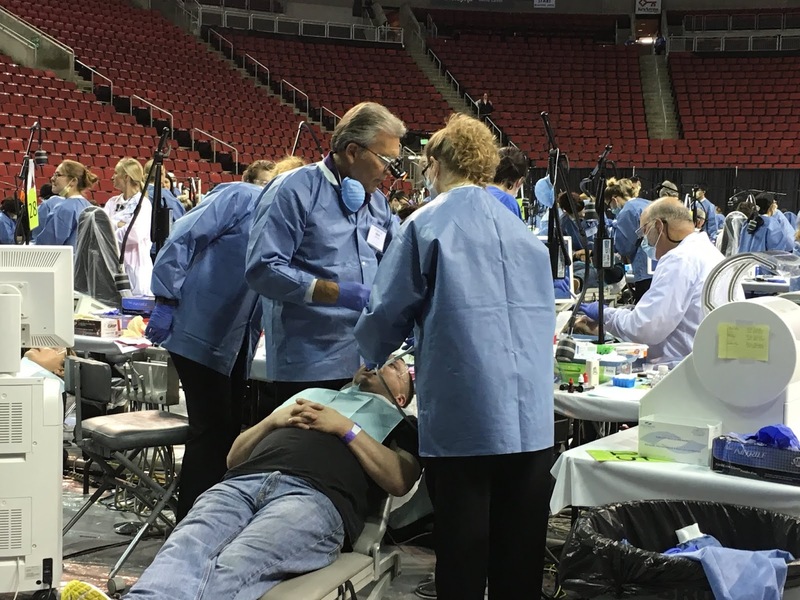 Funded by nonprofit Delta Dental of Washington, the state’s largest dental benefits company, we work toward a shared vision: All people enjoy good oral and overall health, with no one left behind. The SmileMobile is made possible through a partnership between Arcora Foundation, Delta Dental of Washington and Seattle Children’s. Annually the SmileMobile provides dental care to 2,000 children and adults. Since its inception, the SmileMobile has seen over 44,000 clients throughout Washington.